Libya's eastern military leader orders his forces to march into Tripoli, the seat of a rival United Nations-recognized government. "Those who lay down their weapons are safe, and those who raise the white banner are safe," Haftar says. General Khalifa Haftar holds the nation's eastern oil terminals and his forces have moved south recently to secure Libya's oil fields. Members of a brigade headed by field commander Salah Bogheib and loyal to Khalifa Haftar -a retired general and former chief of staff for Moamer Kadhafi- hold up their guns as they fight alongside Libyan army troops against Islamist gunmen in the eastern Libyan city of Benghazi. Libya's eastern military leader has ordered his forces to march on Tripoli, sparking concerns that open war could soon break out between the main political factions in a key oil-producing nation. The OPEC member state has been riven by conflict since the fall of dictator Muammar Qaddafi in 2011. For much of that time, General Khalifa Haftar has held the country's east, drawing support from Egypt and the United Arab Emirates and serving as a foil to the United Nations-recognized government in the capital of Tripoli. The two sides have been engaged in UN-sponsored power-sharing talks. But on Wednesday, Haftar's Libyan National Army unexpectedly advanced towards Tripoli. Skirmishes between the LNA and forces loyal to Prime Minister Fayez al-Serraj have since been reported. Earlier, it remained unclear whether Haftar intended to bring the west under his grip or merely increase his leverage ahead of a national conference later this month. UN Secretary-General Antonio Guterres, who is in Libya to meet with leaders, called for calm and restraint. But the order to enter Tripoli came in the early evening in Libya in a voice recording from Haftar posted online, the Associated Press reported. The general told his troops only to raise their weapons "in the face of those who seek injustice and prefer confrontation and fighting," according to AP. This year, Haftar's LNA forces have already sought to bring order to the restive southern oil-producing region. But a campaign to take Tripoli could be even more grueling, says Hamish Kinnear, senior analyst for the Middle East and North Africa at Verisk Maplecroft. "Our base case is that the LNA will soon find itself bogged down in heavy fighting near Tripoli," Kinnear said in an email briefing. "Unlike its recent advance in the south, the LNA will face more determined resistance from larger and better organised militias in the western region." The LNA's strategy of bringing the south's small, opportunistic militias under its umbrella through negotiation and bribes would not be effective in the east, Kinnear says. Despite controlling oil terminals, Haftar's forces would also struggle to finance a prolonged conflict because his eastern faction does not hold sway over Libya's National Oil Corporation and the central bank, he added. The advance of Haftar's LNA answers the "million dollar question" Libya watchers have been asking for years, says Helima Croft, global head of commodity strategy at RBC Capital Markets. Will Haftar finally seek to consolidate control over Libya's northern coast, leaving the nation's eastern oil terminals vulnerable to his rivals? "Certainly, if he's going to take control of Tripoli by force, the question is what does that mean for these sizable energy assets that are under his control in the east?" Croft said. The looming conflict comes at a time when global crude supplies are tightening and oil prices are steadily advancing towards $70 a barrel. On the demand side, global consumption is growing faster than many expected. On the supply side, OPEC and its allies led by Russia are cutting output while the U.S. is poised to tighten energy sanctions on Iran and Venezuela. Analysts and traders keep a close eye on Libya because its oil production has been one of the biggest wild cards in the oil market in recent years. 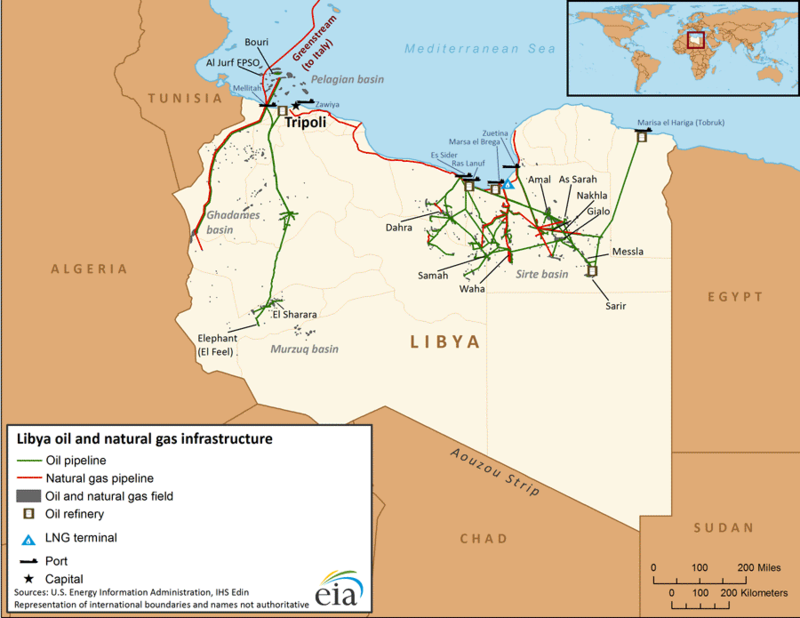 Its output has fluctuated wildly as the nation's southern oil fields have frequently gone offline amid fighting among Libya's patchwork of militias and tribal and ethnic groups. Haftar also briefly lost control of the Ras Lanuf and Sidra oil terminals last year. If Haftar takes control of the west, it could be negative for oil prices because consolidated leadership could allow more crude to flow to the market from Libya, says Croft. However, Croft cautions that it would be difficult for any leader to impose order across the fractious country, and a battle in Tripoli could be a prelude to prolonged fighting. Holding Tripoli, the east and the south could stretch the LNA's capacity to the breaking point. "The problem with the south is it's like the Wild West down there," she said. "There are so many competing militias down there. You have a community that feels so marginalized, that is heavily armed." "To me, that's a powder keg."